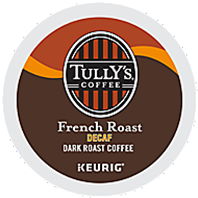 A blend of African, Central and South American coffees chosen to stand up to the darkest and smokiest of all Tully's roasts. This decaffeinated K-Cup pack produces an assertive cup with dark chocolate and nut tones. This full-bodied coffee is perfect with dessert.